This script provides “choice options” that provide finer control over your choices. You can now hide choices that should not be shown using a few simple conditions rather than duplicating a choice list several times using conditional branches. You can disable choices from being selected, which is simply impossible under normal circumstances. 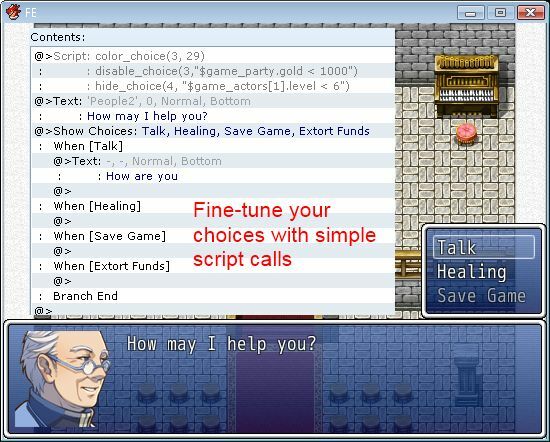 A list of tutorials that show how choice options can be used. You can look up the available methods in the reference section of the script. The choice_number is 1 for the first choice, 2 for the second choice, and so on. The arguments are specified in in the reference. All formulas are evaluated within the context of the game interpreter, so any game interpreter methods can be called directly. Where the condition is a string representing your conditional statement. The text of the specified choice will be drawn with the selected color. The color is currently a number from 0 to 32, which is not very useful. The colored choice ignores whether the choice is enabled or not. You can use the “disable colored” option to set the color of the text if the choice is disabled. The text of the specified choice will be replaced by the text for this option. This allows you to exceed the 50-char limit imposed by the editor. You can also specify a condition along with the text. When the condition is satisfied, the text will be displayed. Because that’s how the editor displays it. This is wrong. Leading zeroes are treated as octal numbers, which is completely different. shared this great paragraph at here. Forgive me if this has been asked already, but can this script do -or be updated to- display message/text/help_window when hovering over a choice option to display additional information to the player outside of the choice box? For instance, I’m creating a character creation and when selecting ‘Race’ it would show additional choice options such as ‘Human,’ ‘Elf,’ etc. So when hovering over the choice option of say ‘Human,’ a message box/text/help_window would display information to the player about that choice before selecting. If a have a variable,the id is “1” ok? And i pretend to disable the choice if this variable is “ON” and the value is 5 our more…What i need to do? to ask if you don’t mind. I was curious to know how you center yourself and clear your thoughts before writing. nice article, keep it up. (PPP), and yellow being worn by the supporters of the royalist and anti- Thaksin Shinawatra motion the People’s Alliance for Democracy (PAD). useful data, thanks for providing such data. Hello, GREAT script! However, I run into an issue if it’s combined with Yanfly’s Message System. When both scripts are installed, the choices will not extend correctly according to the text in them – if the text within the choice is too long, it will be simply cut off at the right end of the screen. I tested this in a new project with only this script and Yanfly’s Message system and it really seems to be a compatibility problem. Since many people use his scripts, maybe you could look into it? Okay, strange, I played around a bit and it seems like this only happens to the [first] choice in a project. After that, everything works perfectly. So now I’ll just have to think of a choice with short answers for the first choice in my game I guess! Alright, I was wrong again. It’s not the first choice in the game that gets cut off, but the first choice in each PLAY. I kinda figured out the cause of the problem. Only using Yanfly’s Message System with Choice options will not lead to issues, but if you use Yanfly’s Message System to customize the font of the game, the choices may get cut off at the right side of the screen. I looked through your script and realized that it also applies changes to the font settings. I don’t know much about RGSS but I can imagine that’s the reason why they work against each other a bit. Yes, this script includes the ability to change text color, which may conflict with others that also change font settings. I kinda “solved” the problem by commenting out the “def reset_font_settings” in line 322. Now I cannot change the color of choices anymore, but all other functions of your script work completely fine and there are no compatibility issues. Yes, as long as you don’t need the choice coloring, it’s fine. Please help… This is a good script.. But it always comes up with this error everytime I start new game or load a saved game..
Do you have other scripts installed? There may be a compatibility issue. I just checked in a new project and it starts a new game fine. Hello, supernice script! is it possible to set that the choice will be hidden if the specific enemy IS NOT in the ongoing battle troop list? You should be able to use that as your formula. Note that counting starts from 0 instead of 1. I’m having an issue combining conditions. I can’t seem to get the syntax right. This one doesn’t give an error message, but it doesn’t hide the choices properly either. What do you mean by “choosing options in menu”? Heys, there’s a bug in this script where disallowing “cancel out of choice list” doesn’t work anymore. It’s like, I could never figure this out on my own. Thanks, miss (I presume you’re a lady), I really am hoping that when I implement this, that it works. I also used your ‘Large Choices’ script, and it works flawlessly. I do wonder though, if you happen to have a script that will allow me to press a button on any map screen to call up a special menu? I was able to do this on RPG MAKER XP, but the script module there, compared with VX ACE…no comparison. I’ve even tried to import those scripts, and failed. Thanks in advance for any insight. If you create a request here detailing what you would like I can look for or create some solutions. Could I get some help on this? I have an event set up to where the player can choose monsters to “craft”; however, if they don’t have the necessary ingredients to craft a monster, that monster will only appear as “?? ?” and will be disabled. So when you have no ingredients, only five “?? ?”s are there and the Cancel option is the only selectable option. Here is the script I have set up. Script ‘Game_Interpreter’ line 1409: SyntaxError occurred. And so I thought, oh, that seems easy to fix. I just have to go into the script and change, in example, (1, “game_switches”) to (1, “game_switches”: true). Your disable_choice call was initially correct. And so I have updated it so that for the text_choice command, you can specify a second argument which will be a condition that determines whether the text_choice command will have any effect. The first one is the same as specifying a condition that is always true. The second one specifies that the text “?? ?” will only be displayed when switch 63 is ON. When switch 63 is OFF, it will display whatever the original text should be. Notice where the periods and parentheses are placed. Alternatively you could use the exclamation mark ! to negate the condition. means if actor 1 has not learned skill 26.
who i do to hind/disable a option if the actor 1 (from data base) or actor 0 from party (the leader) don’t haves a specific skill, equipment , name, or class? Depending on what you need it may or may not be more complex. Awesome! Works flawlessly. Exactly what I was looking for. Thank you for sharing all these great scripts! something is mixed up in the script’s description of the disable option. The tutorial above says “disable if condition is true”, the comments inside the script say “disable if condition is NOT met”. Because someone had a problem with that, I assume that the script instruction are correct and the tutorial description above wrong – please check. Script description is wrong. It should read “disables choice if condition is met”. Thanks for pointing it out. I have a question/problem in eventing. If you want to disable a choice permanently you need to use something persistent like a switch. Hey Hime, i was wondering if its possible to have a multiple checks for the same choice. When i put them, one ontop of the other, it doesnt appear to play nice. disable_choice(1, “$game_variables 2”) is what im using and it seems the bottom takes precedence. Any tips or tricks :P? You need to use logical AND && or OR || to combine them. LOL somehow i couldnt figure out to extend the “” around both arguement. smh. Thanks for the quick response Hime! Note that for short-hand, you can say v instead of $game_variables. I definitely prefer to type less. This script is marvelous! It helps me a lot on creating choices with many customization. However, I encountered a problem when I use this script with Large Choice. and use hide_choice(7, "$game_variables< 1") to hide Choice 7. It works. There&apos;s however a slight problem because I used Choice 8 as a branch that will be executed on pressing Cancel button. When all 8 choices appear, cancelling works as intended. (Choice 8 is executed.) However, when choice 7 is hidden, cancelling suddenly does not work as if choice 8 never existed. After testing out more by changing Cancel to activate Choice 7 instead, it executed Choice 8 when the actual Choice 7 is hidden. It will still however execute Choice 7 as intended when all choices appear and none are hidden. I believe this is numbering problem, if there&apos;s any workaround or update to the script in the future to remedy this problem, it would be wonderful! In the meantime I&apos;ll use the workaround for now. Thanks again for the great scripts! Thanks for the report. I will look at the demo you have sent and see if I can resolve the issue. Thank you so much for bug fixes. Issues with the scripts are resolved and now it works like charm! Hi, nice script! Will this work with your Large Choices script? hello Hime, thanks for the great scripts. your large choices script worked flawlessly for me, but I&apos;m encountering an error with your choice options script. Script &apos;hide_choice&apos; line 257: NoMethodError occured. any idea what this might mean? Are you testing from a save file? i started a new game and it works perfectly, thanks! I want to make a choice appear when a specific item exists in the inventory. the choice is hidden when I have the item #2, and revealed when I don&apos;t have the item. What do I add or change in that command you previously gave me? Put a ! before the formula. Great! Tsukihime did his magic again! 😀 Works perfectly!! Thanks a lot! I have the exact same problem with items as Jaden had, except when I try to disable or hide a choice based on whether I have the item, I receive an error in game whenever it gets to that point. I&apos;m not exactly sure what&apos;s wrong, because otherwise everything is working, I can hide choices based on character stats, using switches, etc., but for some reason the has_item? line doesn&apos;t work. What is the error that you’re getting? So, if I try with "!$game_party.has_item? ($data_items)"
Script &apos;Game_Interpreter&apos; line 1411: ArgumentError occured. Script call box is too small and breaking up the lines. Let me know if it’s still too long for the box. your scripts are awesome, btw. Hi Hime, nice work over here! Hi! I&apos;m trying to make an event which triggers a teleport action unto the player, with available destinations based on whether or not certain triggers are On or Off (think Dragon Quest Return spell, or FF14 warp crystals). So I try stuff like hide_choice(1, "$game_switches[xxxx] == true"), with and without the ! in front of the !, and all I can get is either having all choices to show (without !) or none (with the !). Which means "hide choice 1 when switch 1 is not ON". Have you tried changing your switches in-game? Hello! Thanks for your quick response. 0022 is currently triggered ON, 0023/4 are OFF. Only choice 4 is shown. I made a NPC event that triggers 0023 ON when you talk to him. Does this script require another one of your base script? I only have Large Choice besides this one. Remove the leading zeroes. This script can be use standalone, and is compatible with large choices. Hey there Tsukihime I really like your script and it&apos;s perfect for what I need to do, unfortunately I seem to have a bit of a problem that I can&apos;t figure out! So I have hide_choice(2,"!s") and it hides the choice just fine. BUT! When I switch the switch on, it doesn&apos;t seem to unhide the choice. Any ideas? Remove the leading 0&apos;s. Those should not be part of a number. Hoho! Indeed! Thank you very much, don&apos;t know why I didn&apos;t try that. I just figured that it would be fine, since that&apos;s how it has them inside the program itself. Those are mainly for display purposes and honestly quite misleading, because the way Ruby handles numbers treats leading 0&apos;s very specifically. 1. “Why would I want to do something like that? .Do it yourself if you’re going to want it done so quickly. ..Hire a mercenary or two if you need to. 3. ..”Looks to be we’ll heading out, .everyone. .I will grant you this. and by selecting review, it will go back up and display the last thing that the person who you’re responding to said. But when there are a lot of choices or a lot of things said, then reviewing a lot slows things down. The script doesn’t provide support for variable-height choices. I don’t think the default choices support it either. You’d have to make a request to have that kind of functionality. I didn’t mean literal variable heights, I meant either the ability to line break/ “enter”/ the choices formatting to a new line when the text stretches the width of the screen. And okay. I just wasn’t sure since it says you can break the 50 character limit. From the perspective of the window, they are variable heights, because one line of text could be 1 line, another could be 2 lines, 3 lines, etc. Also did I try n and N.
but there were no given instructions on how to do so in the script. I tried | and LB and |LB with no luck. Today i have only a little question. Where i can find reference for the condition that i have to use in the script call? For example i want that choise 1 is show only if pharmacology is 100. The reference is basically the scripts and the help file. For the most part, you would have to dig around and hope to find what you’re looking for. For example, phamacology is a battler parameter, so that means you would look at Game_BattlerBase or Game_Battler or Game_Actor or Game_Enemy to find where that can be obtained. All parameters are defined in Game_BattlerBase near the top so that isn’t too bad. I can’t get it to work. Now the command gets too large to fit in the script window, and it automatically breaks onto another line (Damn limitation)… Anyway Tsuki, I’ll go by the Variable system, since I don’t want to further bother you with this! I tried this also on a new, clean project and results in the same error… If you know what Im doing wrong, let me know! If not, I’ll use the Variable system instead! You need to specify the actor ID. Script ‘Game Interpreter’ line 1411: SyntaxError occured. Though, I just typed hide_choice(1, "$game_actors.class_id == 1)"
But the call script put 1)" in a line below the rest. Look at the last two characters. I’m working on a basis crafting system that allows players to combine 2 basic items into a more advanced item (included two of the same item.) To do this, I’m using 4 variables to ‘watch’ the inventory, and calling said variables using this script to manage what can be made. My problem is being able to tie 2 variables to a single choice. I’ve tried “hide_choice(1,”$game_variables(101) < 2 && $game_variables(103) < 2")"
as well as using two separate lines in the same script call. I managed to figure it out. I guess some additional variable-work was needed. I was able to put together the following script call. It has passed my initial testing in-game. && is the AND operator, which means both conditions must be satisfied. If you say v1 <= 2 && v3 <= 2, then if you have 10 v1's, the condition would be false and therefore it will not be hidden. When you're combining items, the option should not be available if either v1 OR v3 are insufficient, using the || operator. This is a really cool script. But I downloadet it to use it with modern algebra’s Quest System, so that I could make kind of a guild master who could give you quests and when you chose one, the quest disappears. Because I don’t want to make an extra switch for every quest, I wanted to use the built-in script call for conditional branches “quest_revealed? (quest_id)”, but is there any way I can use that as a condition in your script? Thanks for replay. Script ‘Game_interpreter’ line 1411: syntaxError ocurred. Does anyone know what I’m doing wrong? Thanks in advance. You have an extra parenthesis in front but no matching closing parenthesis. Works fine. 🙂 I have question. I want to change the color of disable choice. How can I do that? o_o thanks. I’ve updated the script with a new choice option. See the “disable color choice” for usage details. How can I make it work with variables? Thanks, Tsuki! But one more question! I want to make a variable that controls the character aligment (lets say variable 1). In some specific dialogs, i want to make some choices available or not available if, for example variable 1 is higher or equal to 25. How do I tell the script to make this comparison? Does “disable_choice(1, $game_variables >= 25)” works, or I got it wrong? Ok, one more question: How can you tell if there is an actor in the party. But you’ll probably need to find a way to properly write it. I’m sure I’m formatting something wrong. Also the script page isn’t long enough so it’s breaking the script so i’m not sure if that matters but I’m ensuring there aren’t any spaces. Press enter after the dot so that include? (…) stays together. Doesn’t work. I get this error. Script ‘Game_Interpreter’ line 1411: SyntaxError occurred. Take off the “if”. You also want to say “!$game_switches” since the hide_choice option will hide the choice if the condition is true. Selecting choice 1 opens up a whole line of dialogue, which would end with a choice of ‘asking another question’, which would return you to the choice situation above. I know you can just copy/paste, but when you get to so many lines of dialogue and branches, it gets a little hard to keep track. No, but you can use “Label” and “Jump to Label” commands to go back and forth. Choice options only affect the choices themselves. Script updated with a new option “text_choice” which allows you to use a script call to set the text to display for a particular choice. This allows you to exceed the 50-char limit the editor imposes.